Search in: "Guitar, Electric Bass"
Der ultimative Einstieg für Rockgitarristen! 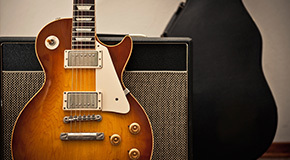 Within our large selection of over 26,000 sheet music titles for guitar, electric bass and related instruments such as mandolin, ukulele, banjo and lute, there is something to suit everyone. Here you will find classical instrumental method books for all age groups, études, technique method books, transcriptions, playalongs, musical pieces with and without accompaniment or multiple instruments and current chart hits.